Much has been said about the decision by Getty Images to make available to editorial online outlets, over 35,000,000 images, for free. Well, free in the sense that you're not spending any money to use the images. However, in exchange for this, you agree to allow Getty to track all the visitors to your website. How many come, their IP addresses, how long they stay, and so on and so forth. Make no mistake about it either, this isn't "free forever", Getty is looking to get into the big-data business, connecting image viewer data with data analytics from other sources. Once they reach a critical mass of users, they will essentially be able to sell advertising alongside and beneath their images (note the big white space between their name and the social media links in all the samples everyone is sharing) and they can also sell animations, where before the image appears, an ad is displayed for a few seconds, just like the lead-in advertising on videos just like YouTube. The revenue from repeated views here is far and away greater than the few cents Getty makes from web page usage. Getty's big splash is akin to Steve Jobs keeping secret the iPhone and then getting hundreds of millions of dollars in free advertising to promote it when it launches. Getty has made clear that their current contributor contracts allow for this, and that no compensation is due the rights holders of those images. These images are put forth as a part of a marketing effort, and so to that end, those who created the images are out of luck. Getty has said that they are tired of suing their userbase, and creating angry factions of the online community like those at organizations like "Extortion Letter Info" where lawyers gather together to fight off Getty's demand letters. Could there be something else that's a problem for Getty? In 2010 we reported on a copyright problem where the methodology used by Corbis, on the advice of lawyers, was found to be flawed, and countless registrations were deemed invalid (see: Corbis' Copyright Registrations - Images "Not Registered" Court Finds). Could it be that Getty does not want to face this same house of cards that could be stirring within their registrations? Could it be that all (or almost all) of their registrations are invalid? Or, perhaps Getty just doesn't bother to register their work, and as such, the teeth that people think they have are actually toothless and decaying gums that have no bite to follow up their bark? They have a total of 172 registrations. On the other hand, we here at Photo Business News register regularly, and a search of the Voyager database shows 229 records for our registrations alone. Consider the tens of thousands (or even hundreds of thousands) of images Getty produces worldwide each day, and receives from contributors, and unless there's some secret registration system they are employing, or they are doing it under a different name, then there's a bit of a problem for Getty in that they're not registering their work. That's a problem if that's the case. Oh, and the notion of a "database registration" doesn't really hold much water either when it comes to photographic registrations. So, if your copyright registrations have no teeth and thus you are not getting your day in court, and you're engaging in toothless fights with hundreds of infringements, why not allow people to use them and get analytics out of them? The fact is that there are millions of images sitting dormant and otherwise generating no money on web pages, even when they're rights-managed images at a web resolution, someone forgets the image is there, forgets to renew, and so on and so forth. Royalty-free images, of which many many rights-managed images are competing against, generates a one-time fee of about $1.00. Then, that image sits there for months and years. Now, most every blogger wants good SEO, and they work hard to link-bait people into driving traffic, whether to sell ads, or generate notoriety. Now, you have thousands and even hundreds-of-thousands of bloggers generating millions and millions of pages using free Getty content. Once a critical mass is created, Getty will begin selling ads. (1) provide copyright management information that is false, or (2) distribute or import for distribution copyright management information that is false. (a) Civil Actions.— Any person injured by a violation of section 1201 or 1202 may bring a civil action in an appropriate United States district court for such violation. (2) Actual damages.— The court shall award to the complaining party the actual damages suffered by the party as a result of the violation, and any profits of the violator that are attributable to the violation and are not taken into account in computing the actual damages, if the complaining party elects such damages at any time before final judgment is entered. (A) At any time before final judgment is entered, a complaining party may elect to recover an award of statutory damages for each violation of section 1201 in the sum of not less than $200 or more than $2,500 per act of circumvention, device, product, component, offer, or performance of service, as the court considers just. (4) Repeated violations.— In any case in which the injured party sustains the burden of proving, and the court finds, that a person has violated section 1201 or 1202 within 3 years after a final judgment was entered against the person for another such violation, the court may increase the award of damages up to triple the amount that would otherwise be awarded, as the court considers just. So now Getty gets to go after people who remove copyright management information, and collect on each of those in civil court. Faster and easier than federal court, and much cheaper. Now, enter object recognition. A company like Stipple monetizes images with their own embedder that means that if I as a photographer take a photo of a celebrity wearing Prada boots, using a Gucci purse, and an Old Navy dress, provided I include that information as tagged in the image, I can generate revenue if someone clicks through from that image to a site like Amazon that would sell them, and I collect a few percentage points in revenue from each sale. A $400 purse could garner $4 - $8 in income from a single click/sale, so it encourages photographers to manually tag them. A company like Samsamia tags images using fashion image recognition semi-automatically. Other software automates object recognition so that no one needs to manually tag them - it's done automatically. If Getty controls the iframe where all this is happening, on hundreds of millions of images around the world, they could generate tenfold amounts of income. As such, Getty has just co-opted the entire blogosphere as free distributors of their advertising vehicles. Getty's minions are now doing their bidding like the Wicked Witch of the West sent out her flying monkeys, yet the monkeys had to be fed. Getty's minions are doing all the work for less than peanuts. Consider that a magazine produces editorial content in order to generate readers who will view the paid advertising adjacent to it. It spends a great deal of money producing that content, and then charges advertisers. This upends that model, where the editorial content is being produced for free, in every known niche of interest globally, and Getty gets all the income from the ads and also a much broader audience for commercially viable images to consider. This is why they're allowing the New York Times to use their content online for free, which at first blush seemed like a bad idea. But, in the end, they are essentially taking over the advertising that appears in the newspaper. They are not satisfied to take over the ads adjacent to the editorial content, they will now own the ads within the editorial content. You can't pay to get monetizable links within a New York Times editorial story - that's as sacrosanct as the space inside a baseball diamond to sports fans, even moreso. However, Getty, provided the NYT opts to use the images for free, has now given up control of the visual part of their editorial content, ceding it to Getty. Imagine you're a Getty ad sales rep - and you can say "we can offer you an ad inside the New York Times' editorial space." In fact, it's even reasonable to assume that, say, the pharmaceutical CEO who testifies before Congress on a particularly polarizing point, and who could never dream of being able to immediately place adjacent to the article about his testimony, a rebuttal or company link for more information on the company's perspective, could now, within seconds of the story appearing, buy an ad that would appear below his photo, or as a 5 second preview before his photo appears, providing a rebuttal to the article. In fact, a company could buy such a rebuttal ad space wherever images from that testimony appears, worldwide. I even see a point where the Getty sales team sees news events of this nature on a schedule and makes initial outreach to the marketing departments for those companies, pre-selling ads to appear beneath or over the photos just like magazines put out a schedule of topics in the comping year so when the big travel issue comes out all the travel companies have already bought space in those issues. As such, I suspect, respected news outlets will not cede this space to Getty's free offering, unless they're getting a piece of it that equals or exceeds what they would get for the ads adjacent to the editorial content. The NYT may well continue to pay for their uses so as to keep their editorial pages within their control. 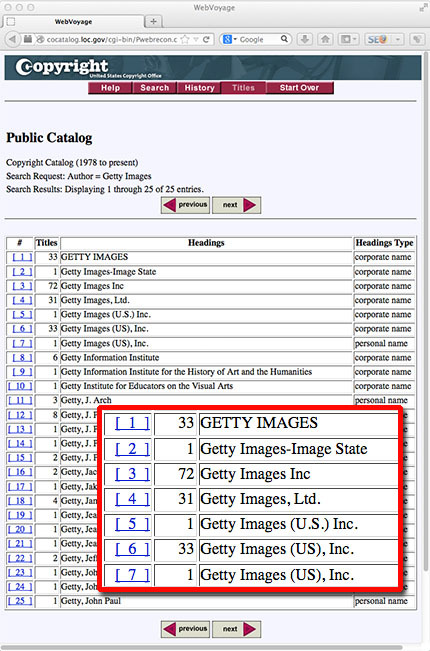 Everyone seems to see this as Getty's way to combat copyright abuse. This is a naive as a day old bambi. It makes Getty appear as if they are giving up, giving in, and supporting blogs and being helpful. They are not. They are positioning themselves as the world's largest advertising resource so that the Carlysle Group (NASDAQ:CG) , which owns Getty, can turn around and sell Getty to Google or Yahoo. The pitch is "this is the YouTube of still photography - free photos and revenue from wraparound and play-over ads...". Look at how Google snapped up YouTube for that reason. Free videos propagated globally and Getty just sits back and counts the validated eyeballs and collects all sorts of data about them. It's the same with still photos now. Further, As crazy as it sounds, when Carlysle bought Getty, they did it in fast-and-loose-80's-style leveraged-buyout fashion, using a loan secured by Getty's assets to buy Getty and made Getty responsible for paying the loan back. Getty doesn't have that kind of money sitting around, and they've got a $1,200,000,000 loan coming due in about 2 years. So far, the contracts that Getty has with it's contributors allow them to do this as marketing, for free, without compensation to the contributors. And, just as with Getty monetizing the metadata of an image from Pinterest without being obligated to share that income with the photographers (because Getty's contracts don't require it because a metadata income stream isn't from an "image license") and from what I have heard, there are no plans for photographers to earn any part of the advertising that is adjacent to (or precedes the viewing of) their image. Getty's telling photographers "oh, this will drive people to our site and the commercial sales will give is a reach we haven't before." This sounds remarkably like "we'll loose a little on each use, buy make it up in volume." The real losers will be the content producers - the photographers. Of course, Corbis and the rest of them will look at this and wait, and all the while Getty's images will get embedded deeper and deeper into the internet's archives and the rest of the stock agencies will be playing catchup. Considering that 20% of Getty's archives are generating about 80% of their income, this isn't a problem, monetizing the rest of the 80% sitting around, making them all a sort of homing pigeon. However, Getty's own internal valuations are at about $0.15 per image, so if a photographer with 100,000 images decided to pull out, the monetizers look at that and say "oh well, too bad for them, that's about a $15,000 loss for us. Moving on. Next." Welcome to the new world order of stock photography.